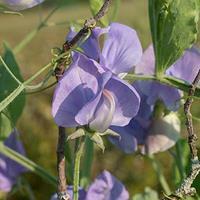 There's no scent in the world that compares with the perfume that rushes from the petals of a pre-Spencer sweet pea. Folks have likened it to the essence of a freshly opened beehive and have never found a synthetic substitute. 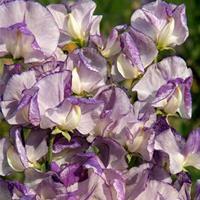 After years of experimenting with fragrant sweet peas, I offer you the most floriferous, aromatic sweet peas. 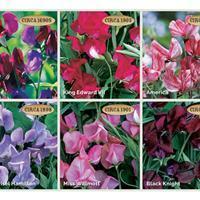 Includes 6 pots, 1 each of: America, Cupani's, Black Knight, Miss Willmott, King Edward, and Lady Grisel Hamilton. All offered as 2-3 plants per pot. Includes 6 individual packets of: America, Cupani's, Black Knight, Miss Willmott, King Edward, and Lady Grisel Hamilton. 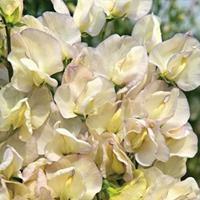 (Sweet Pea 'Flora Norton' will be substituted for 'Lady Grisel Hamilton' from 2/15/2019). 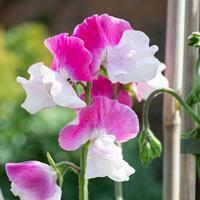 Buttercream frilly flowers and an excellent scent keep Jilly at the top of lists of the best sweet peas for your garden. Long stems for cutting, too. Best show in rich deep soils where summer nights are cool, they pluckily bloom with abandon for a month or more in hotter areas if started in early spring. 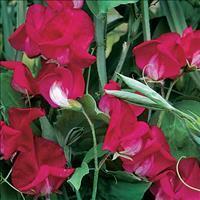 Of the hundreds of sweet peas available at the turn of the century, 'King Edward' is one of a few survivors! A stunning flame colored fragrant sweet pea introduced in 1903 by Henry Eckford. Seeds poisonous. 2-3 plants per pot. 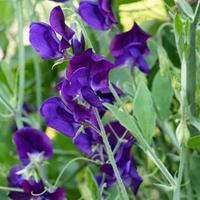 Do I imagine it or is it a fact that lavender and mauve and purple sweet peas have the sweetest fragrance? "Lady Grisel Hamilton is delightful," recounts Louise Beebe Wilder in her 1932 book, The Fragrant Garden. 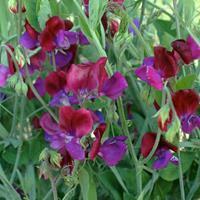 A stunning bicolor variety, with large flowers--four to a stem--arrayed in lustrous colors of maroon and violet blue. 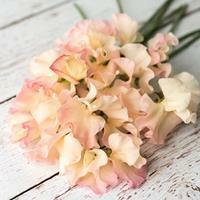 Sweetly scented. 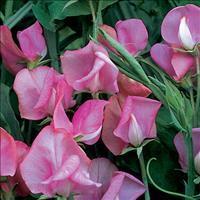 An award winning fragrant variety from England with long stems and wavy petals of cream edged in deep pink. Seeds poisonous. Tall, long stemmed and dramatic, ‘Nimbus’ has swirls of prune purple to inky striping on a white ground, the wavy flowers edged in that same smoldering hue. Sought after as a cut flower, it adds a delicious fragrance to any bouquet. Closely related to the original wildflower of Sicily, this selection shares the honey and orange blossom fragrance of those originals. Rose, purple, scarlet, lavender, pale pink and cream blooms. The frilly party dress of the early summer garden with enough scent to make you giddy, ‘Route 66’ is an improved update on a 1970s favorite. It’s not high maintenance, either, just provide humus rich fertile soils, regular moisture, and a pinch when 6” high for more branching and blooms. 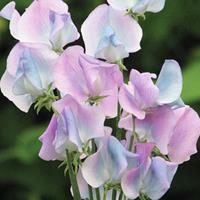 A beautiful cream colored sweet pea with soft blue tints and strongly scented, just like all of our selections. Generous blooms sport wavy edged petals on long, willowy stems, perfect for cut flowers. It harkens back to an earlier era but hails from 1976.